there's a lot of apples around right now ... what are ya gonna do with them? Fall can claim the scent of crisp air, the sound of leaves crunching underfoot, and the sight of all those changing colors, but what says fall in the best way is the taste of apples. 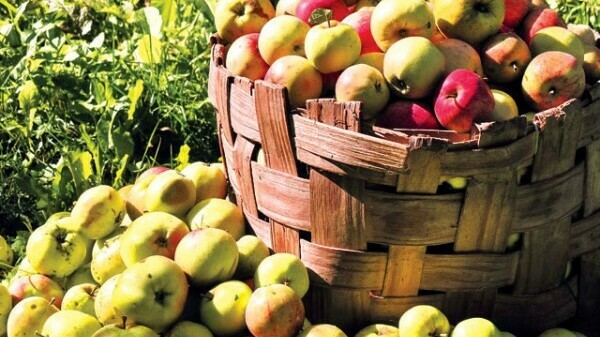 Now, as delicious as apples are (and, yes, they are quite delicious), there are a lot of other fun things to do with all those apples you picked at the orchard. While this list is not exhaustive, it’s a good start on some good, old-fashioned, apple-induced fun. This all-American classic is sure to delight. Make sure you call up grandma, though, to get the good recipe. Best served with family, a side of fire in the fire place, and the knowledge that as soon as Thanksgiving’s over, Christmas is right around the corner and you’ll have an excuse to bake another one. Baked apples are absolutely delicious and will fill your house with a scent unparalleled by any apple cinnamon candle. All you need are apples, cinnamon, brown sugar, and butter (but you can add pecans or raisins, too). Once finished, these tender apples taste great with a side of vanilla ice cream. Probably the easiest way to eat an apple besides plain is the caramel apple. All you need is an apple on a sturdy stick, warm caramel to dip it in, and a sprinkling of chopped nuts, raisings, mini M&Ms, or candy sprinkles. Also, one of the few desserts you can eat while walking. Contrary to its namesake, there’s no butter in apple butter. It’s a good way to preserve your apples to enjoy throughout the winter, or, if you don’t have the time, buy a jar or two at a local orchard or farmers market. This deceptively simple treat takes a little know-how to be homemade. For chunkier applesauce, try using a potato masher, but if you like it smooth, run it through a food mill. Remember that the lemon enhances the flavor of the apples and balances the sweetness, so if you like it sweeter add both sugar and lemon juice and vice versa. ‘Tis the season to drink hot mulled cider. Apple cider can be bought pre-seasoned at the grocery store, but if you want to try your hand at it or like a certain flavor, then buy unfiltered apple cider and add to the concoction orange, cloves, cinnamon, allspice berries, nutmeg, cardamon, and brown sugar. Customarily played on Halloween, this game employs all the aspects of flotation, cold water, and catching things with your teeth, without using your hands. All you need to play is a large tub filled with water, apples, and a shark-like ability to detect your buoyed prey. If you’re into arts and crafts, try making an apple stamp. Cut an apple in half (across the wide middle) to reveal the star-shaped core, or cut it top to bottom to make a picture-perfect print. Blot dry the exposed surface, slick with a thin layer of paint, and press to heavy paper. Making an apple candle holder is one of the easier apple crafts. All you need is an apple corer, and a candle that will fit in the middle. Then just enjoy the apple-rific aroma, but don’t leave it unattended (your landlord will get upset). Not only is this one fun to make, but they can be somewhat sinister-looking decorations for a Halloween party as well. To create these tiny, wrinkled faces peel an apple and coat the exposed part with a mixture of lemon juice and salt to prevent from browning. Then with a small knife or potato peeler, carve in some facial features (stick to the big stuff, though, as smaller features will be lost as it dries). If you want to go the extra mile, add rice grains for teeth and whole cloves for eyes, or, when it’s dry, some wire for glasses or cotton balls for hair. Then just set the carved apples on a wire rack to dry, but the kicker is that it takes about 2 weeks for nature to take its course, so plan ahead.